Claudius Dornier was a titan of German industry. A man who almost single-handedly built the German aircraft industry as well as some of the Luftwaffe’s most fearsome planes during WWII. His son, Claude Jr., however, had somewhat different interests. Senior shipped Junior off to study engineering in the U.S. at the start of the war to avoid what he knew was going to be a bloodbath. When America joined the war, Claude Jr. relocated to Argentina, pretty much as far from the fighting, and Hitler, as he could get. Germany needed every young body, especially one attached to an engineer’s head, and Claudius, whose younger son Peter stayed in Germany, wanted someone to continue his legacy if things didn’t work out. Fortunately, they didn’t, but Claude and Pete managed to survive the war. They weren’t allowed to build airplanes in Germany, however. Back in South America, Junior was fascinated by Argentina’s transportation issues. A poor country like Germany was about to be, most Argentinians could’t afford a car and they would cling to what vehicles there were like “grapes on a vine.” So Dornier started dreaming up solutions. He would doodle designs for three wheelers and other tiny cars trying to come up with the perfect way to get the most efficient use of space. He wanted to design a four seater, but coming up with a way to get ample room for rear passengers in a small package stymied him. Until he had a brainstorm. What if instead of entering the side of the car, everyone got in on the ends? A door in front, a door in back with the seats situated back to back. Then the passengers in back have the same amount of legroom as the folks in front. Plus, this would make the car symmetrical, simplifying the design which should bring costs down. Brilliant. How come no one had ever thought of this before? Well, oddly, at the same time someone did. This thing showed up to the 1948 Paris Auto Salon. I have no idea what it was called, but it had a door in front and back and an air cooled 4 cylinder mounted in the floor. Kind of what Claude Jr. was imagining. It was only a concept that seems to have been lost to time, but pictures of it went around, and Junior put away his drawings. Claudius Dornier had set up an office in Madrid since aircraft production in Germany was verboten, and Junior moved to Spain to help with work on a new, light utility aircraft that would become the Do-27. It was never produced in Spain, but became a small workhorse for the West German Air Force in the 50’s. Anyway, back in Germany, Dornier had shifted to manufacturing looms in place of planes and Claudius wanted to expand. It was 1953 and, as the German economy recovered, people were clamoring for cheap transportation. Claude Jr. saw this as the perfect opportunity to dust off his old drawings. He started really working on it alongside the Do-27, refining the original rough thought. He decided to have the doors open up so that they’d keep the rain out while open. He made it perfectly symmetrical, almost pyramid shaped, and stuck the engine in the middle like any good engineer would. He gave it rigid axles in front and back to save on cost. By December ’53, he had his sketches and a small wooden model ready to show his father. Claudius was a shrewd man who was notoriously difficult to impress. He hadn’t been considering entering the auto industry. That was a monumental undertaking. But, Dornier had plenty of experience with large scale manufacturing. And, Junior’s design was simple and practical, so wouldn’t take too much of an investment relatively. Senior combed over his son’s designs carefully. He had to agree that is was a novel and workable solution to the small car conundrum. So, he okayed the building of a prototype. As that progressed, it became clear that airplane production was about to restart in Germany, so the Munich factory was readied to begin building things that fly again. But, the Delta, as the little car was now called owing to the triangular shape, wasn’t abandoned. Claudius wasn’t about to let his son’s hard work go to waste. He decided they would get it ready for production and then sell it to an experienced car manufacturer. Work on the prototype was done in Madrid. The designs were massaged. Each wheel got a swing-arm. The doors, instead of being the entire width of the car, were made a little narrower to make room for head and taillights. A simple and dirty solution to keeping the doors open was a spring stretched across the roof. Claude wanted to use a durable, single cylinder diesel engine, but no one in Germany was building something so fantastic, so he installed 200cc ILO and Sachs motors alternately. The Dornier Delta prototype which still survives. By the fall of 1954, the weird thing was shipped to Germany for test drives over the streets of Munich. Proud of their invention, the Dorniers were shocked to see another car with a front door also being tested in the city. BMW had just licensed the Isetta and Claude Jr. was beaten to the front door punch once again. But, his car could seat four, so father and son pressed on. Claude’s inexperience with car design became apparent when the front suspension broke through the floor one day. The 9 horsepower engine also only gave it a top speed of 65 kph. But, the kinks were worked out and a 400cc Victoria engine was installed, and in June, 1955, the Delta was revealed to a stupefied public. The car was weird looking, that was not in doubt, but folks had to admit that there was a lot of room for something less than 3 meters long. The seats folded for more cargo room, or even a bed when you did both. The press called it “interesting” in what sounds like the same way girls used to describe me in high school. People were definitely impressed with the novelty of it, but it was a little too outside the box. It also wasn’t clear what was going to power the car, or how much it would cost. Dornier took the car to the International Automobile Exhibition in Frankfurt, but aside from curious kooky-loos, the car garnered no interest. Sales material was sent to many small manufacturers, but aside from a nibble from the Victoria motorcycle company, the Delta seemed doomed. But, there was another motorcycle manufacturer seeking to enter the small car business. Zündapp had been one of Germany’s biggest motorcycle manufacturers since before the War. The company was started by Fritz Neumeyer in 1917 to build detonators for the First World War. They started building motorcycles after the war and their bikes were known for their durability and reliability. In the 30’s, Zündapp was the first company to equip their bikes with an enclosed driveshaft. They were the only motorcycle used by the Nazis which makes two big suppliers to the German war machine in this story. Neumeyer had always wanted to build a car. And, in 1931, he came close to building the most famous car of all. In September of that year, Neumeyer got a visit from someone who would change the course of history. And it wasn’t Hitler. It was Ferdinand Porsche. He and Fritz got to talking about building a cheap “Volksmobile.” A couple of weeks later, they drew up a contract to develop one together. Ferdinand did all the design work with Fritz contributing the idea to power it with a 5 cylinder radial engine because he knew it had to be awesome. Within a year, Porsche had produced the Type 12, the first in a long line of prototypes that would eventually become the Beetle. But, the German economy was terrible, so Neumeyer decided to keep concentrating on motorcycles. Twenty years later, however, things were different. The postwar German economy wasn’t great, but by 1955, things were getting better. And, after two consecutive wet summers, people looking for inexpensive transportation wanted something with a roof. 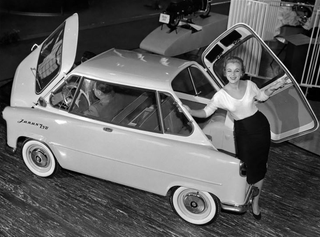 Microcars had come on the scene and they, and cheap scooters, were starting to steal Zündapp’s sales. Neumeyer knew he had to keep up with the market. Microcars often used motorcycle or scooter engines as well as other technology out of two wheelers, so Fritz knew his factory could handle it. But, he didn’t want to go through the time and expense of developing a car from scratch. So, he started to look for something he could license. He started with the Fuldamobil which had been on the market for a few years. It used a motorcycle engine and the ovoid aluminum bodies were made in a press that would make for a reasonable investment. He quickly worked out a deal with Fuldamobil for their S-4, but he requested a few tweaks. He didn’t want a 3-wheeler, and the current design had a tiny rear window. So, Fuldamobil quickly adapted the drivetrain from the Messerschmitt microcar to take two wheels mounted next to each other, replaced the small window with a perspex bubble, and sent a the facelifted Fuldamobil to Zündapp’s plant in Nuremberg. When the Zündapp engineers took the Fulda apart, they were horrified. The car was a lot more complicated than it looked with long welds, a wooden frame, and a complex front suspension system. It was also assembled in a pretty slapdash manner that turned the Zündapp folks off. Fritz sheepishly agreed with his staff and bought out the license for 40,000 Marks. He then went in search of a new car to make. He toyed with Egon Brütsch’s “Spatz,” but it was way more shoddy than the Fuldamobil even. Its license, coincidentally, went to Victoria and it put them out of business. While looking through a car magazine one day, he came across photos from the Frankfurt Auto Show and Dornier’s Delta. Neumeyer recognized that the basic idea was a good one. And, something that could be made cheaply. He called some journalists who had seen the Delta in person to ask their opinions. They all agreed that with some fleshing out, it could work. Fritz’s mind started imagining the possibilities. He always considered his company to be forward thinking and here was a design that could be the future of the motorcar. It was as forward (and backward) looking a car as he’d ever seen. But, it was weird looking and needed a powerplant. So, he showed it to his chief designer, Herr Doering who had been the loudest voice against the Fuldamobil. Doering like it and was eager to take the Delta to the next level. Neumeyer worked out a partial license with Dornier for the basic idea of a car with doors at the front and back. The Delta prototype was sent to Nuremberg, but Zündapp pretty much started from scratch. They immediately ran into trouble with, of all things, the doors. They didn’t want them hinged at the top since that made them almost impossible to close from inside the car. But, they had the same issue with the angle of the doors when it came to rain getting in with the doors open. The design, including the angle, of the Isetta’s door was patented, so they couldn’t just copy that. They toyed with side mounted doors, but that would have defeated the whole idea. So, they tweaked and tweaked until they found something that wasn’t the same as the Isetta, but still worked. They changed the angular shape of the Delta into something much more attractive. But it was no longer perfectly symmetrical with different shaped wheel arches front and back. This was going to push production costs. To counter this, Neumeyer decided to use an engine they had in house, a single cylinder two-stroke out of their Bella scooter. It was just under 250cc’s which meant that the car could be driven by class IV license holders, a fairly large market for microcars. The motor, though, was only 14 horsepower and power was going to be an issue. One place they didn’t skimp was on the suspension. They gave it struts on all four wheels with unusually long suspension travel. This had the dual purpose of giving it a pleasant ride as well as absorbing some of the vibration from the two-stroke. They also also gave it good drum brakes with “turbo cooling” fans on the drums, something unheard of in a super economy car. Instead of a chain, Doering used one of Zündapp’s old tricks and gave it a proper driveshaft, another upgrade from the typical microcar. On the first tests drives, several things became apparent. With the mid-engine and fancy suspension, the Zündapp was one of the best handling small cars around. Also, the little motor could barely make it to its top speed of 80 kph. And it took 38 seconds to get there. Doering, the engineer, pleaded for a bigger engine, but Neumeyer insisted it had to be the 250. The first prototype was ready in September 1956. It had been named “Janus” after the two-faced Roman god of doorways because that’s so perfect. Zündapp let the press test drive the car before taking it to any auto shows. As expected, everyone marveled at the use of space the dos-a-dos seating arrangement provided. It was pretty damn roomy for a microcar. And the Isetta was now roaming the streets, so the door idea wasn’t shocking any more. What was shocking, though, was the racket that overextended two-stroke made. It was described as a howl. Again, the handling was considered fantastic, but the car couldn’t get out of its own way. The low engine power was the key point made in all press coverage. This wasn’t good. Zündapp’s p.r. guy decided he’d show those journalists and made a bet that he could drive the Janus up a mountain with a 23% grade. The engineers back at the factory had estimated the best the Janus could do was a 20% climb, but a bet was a bet and the wonderfully named Erasmus Grüttefien wouldn’t back down. He did decide to be a sneak about it, though, and drove up the mountain in the early morning fog in case anything went wrong. When the journalists showed up to the hotel at the top, he was there waiting for them. They had no idea he had almost completely burned out the clutch and ruined the engine. They weren’t fools, however, and made him do it again so they could witness. Somehow, the little Janus repeated the feat. It would never drive again, but it made it much to the chagrin of the writers. So, with that test passed, the Zündapp Janus went on sale in June of 1957. It had a little more sound dampening, was still underpowered, and was priced at 3290 Marks, almost 600 more than had been planned thanks to increased production costs and the amount of time the car took to build. Doering had come up with a cool idea for the production line. The Janus bodies were hung from the ceiling to make the assembly of the little car easier. But, there was some complicated engineering that slowed down manufacture. The press was more kind now. Roller-Mobile Und Kleinwagen called it a “vehicle of convincing utility” while noting that “it is still very loud, but not in unpleasant frequencies.” Other magazines called it the future of the automobile, “an idea that will survive into the future” said one. A Janus even won its class in the Liege-Brescia-Liege Rally thanks to its smart handling. But, the public wasn’t convinced. The idea of sitting backwards made some people nauseous just thinking about it. In six months, only 1300 Januses were sold. Neumeyer was hoping to move 15,000 cars a year and needed 12,000 sales to make a profit. The Janus was a flop and Zündapp was in trouble. They had invested a lot in the tiny car and it looked like it was going to be a serious loss. Rumors began to spread that the company was going out of business and this hurt sales even more. Fortunately, the Bella scooter was a hit and that managed to keep the assembly lines running. But, by 1958 something had to give. Neumeyer decided to cut his losses and sell the Nuremberg factory where the Janus was built. He would then consolidate the motorcycle and scooter lines at their factory in Munich. Bosch took over the Nuremberg plant and actually kept building Januses (Janii?) until supplies ran out. Apparently, only a couple were sold with the rest left to rot away. A sad end. However, anyone who’s watched the Cars movies knows that the Janus legend lives on in Professor Z. He doesn’t get a Janus badge maybe because the old joke was that people would snap off the “J” from the badges.